Most households never reach the ten key limit, but if a pet loses a key and it needs to be replaced, it can happen. In a scenario where ten keys are already programmed, the new key will not work. The solution is to delete all the collar keys and start over. You can find the instructions for programming new keys here. When you hold the new key in front of the black pet door panel, the blue power light should change from blinking slowly to blinking very fast. That change lets you know the collar key is working and the pet door senses it. If you at that point press and hold the Program Button on the circuit board, the light comes on, and the key won’t program, you have too many keys. The following procedure for deleting keys will only work within 15 seconds of power-up. 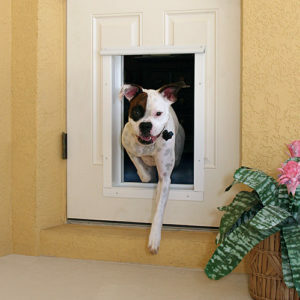 Unplug the pet door – or power it down by pressing and holding the black power button on the upper right side of the pet door frame. Plug the door back in, or push and release the black button to power up the door. Wait until you hear the initial power-up confirmation beep and the blue light flashes to tell you the door is ready. Press the Program button 5 times in a row. The circuit board will beep louder after the 5th press to indicate it is read to delete tags. Hold the Program Button down and press and hold the Test button for about five seconds. A beep will let you know the keys have been deleted. Now, you can reprogram the keys.